What's a vacation without a little shopping? Fabric shopping, of course. There was a new quilt shop in Waupaca, WI, which I cannot for the life of me remember the name of, where I found a few wonderful batik fat quarters. Downtown Waupaca has another sewing store, Sew n' Sew. This year I bought all but one spool of elastic thread from them, which was used to modify tye-dye t-shirts. I hope to get a picture of those soon, I forgot to take any. We've been vacationing in the same place for years but found Stevens Point, WI and Hancock's Fabrics for the first time this year. I found lots of boyish fabrics on clearance ... to me that's hitting the jackpot as boy fabrics aren't that easy to find, especially ones that are on sale. And then there's Hancock's of Paducah, in Paducah, KY with the $5 a yard dump tables. 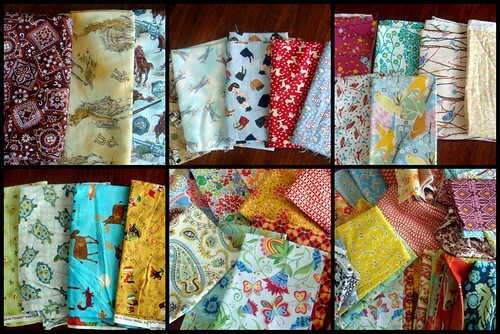 All current fabrics, end bolts. Always a successful visit! After all was said and done I came home with just a little fabric. The budget this year didn't allow for much spending, which was just fine given that I already had a good selection at home. I love the things I did find though.